I Tried With Many tools to take our full screen short of my blog's whole front page. Every time I use print screen on keyboard but it takes what we see and our computer see. So it is very difficult to take our a screen shot of full page. 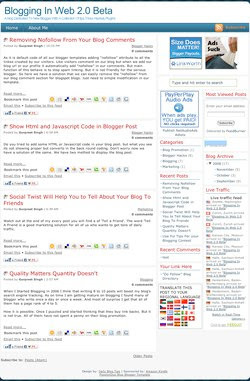 So one day while searching i come to know about a free online screen shot service which will provide us a free full page screen shot of any blog or website in just a click of one button. Go to Super Screenshot enter the URL of blog or website you want to take out a screen shot and hit enter and you are with the full page screen shot Not only this you will get alot of options in the right sidebar asking about image format, size and dimension. Check the Image I have taken for my own Blog.